People who have excellent credits in regaining the independence of our country and in the development of the economy, culture, art, science or other spheres of Latvia are awarded Latvian orders and decorations upon decision of the Chapter of Orders of the Republic of Latvia. The Latvian Brotherhood of Orders is trying to organise all the holders of the orders. How was it established, what is it doing and what are its future plans. 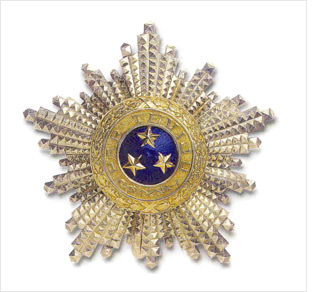 In1994, with help of the President of the Republic of Latvia, Guntis Ulmanis, the THREE-STAR ORDER was renewed and the Order Council established. According to the laws of the Republic of Latvia, neither the state nor municipal structures have any obligations against the holders of the order. Section 12, par two of the Law on Three-Star Order stipulates: "The award of the Order does not give any advantages to the holder ". Among the holders of the orders there are many old people, as well as people who are alone or not involved actively in the society. There are many people who live almost in poverty or in destitution. In this situation, it was important that the holders of the order organised themselves. In 1999, all holders of the order were invited by the Lielvārde Council and the Andrejs Pumpurs Museum to a gathering. During the organisation of the first gathering, Professor Jānis GRAUDONIS proposed to establish a brotherhood of the Three-Star Order. He said: „The task of the organisation will be to take care of the material and moral condition of the holders of the order and to do everything not to forget any of the holders of the high awards”. Thus, J.Graudonis, together with culture worker Liāna Ose, archive worker Ainārs Bambals and social worker Oskars Štrauss prepared the Articles of the Brotherhood, which were distributed to the holders of the order during the gathering in Lielvārde. All the attendants of the gathering supported the creation of the Brotherhood and so they gathered at their first congress on December 11, 1999, in Riga, in the hall of the Academy of Sciences. 305 congress attendants approved the Articles of the Three-Star Order Brotherhood (TSOB), elected the Council of the TSOB of 28 persons, and the Audit Commission of 3 people. The author of the idea, J. Graudonis, was elected the Chairman of the Council. TSOB continued to organise gatherings – in 2000 in Cēsis, in 2001 in Rīga, then in Kuldīga and Limbaži. Furthermore, in 2004, upon initiative of the President Vaira Vīķe-Freiberga, the Parliament adopted the law by which the LATVIAN CHAPTER OF ORDERS was established and the orders of the Republic of Latvia renewed: ORDER OF VIESTURS, GRATITUDE CROSS and the decorations of the said orders. As the awards were renewed, it was necessary to make changes in the TSOB. The Council decided to invite to the Brotherhood all the holders of the Latvian orders. Thus, at the general meeting of December 11, 2004 it was decided to establish the LATVIAN BROTHERHOOD OF ORDERS (LBO). Also the new Articles of the LBO were approved at the meeting, and it was registered with the Register of Enterprises of the Republic of Latvia on April 28, 2004. All members of the TSOB are invited to re-register themselves with the LBO and to receive the new LBO certificate. We kindly invite all the holders of the orders and decorations to join our Brotherhood. The Board of the LBO, which was elected in January 2006, know that many holders of the orders both in Latvia and outside it are influential in the society, full of initiative and capable to work. It is an influential and patriotic power, which could contribute much to the state and the society. But we also know that many holders of the orders need help, which should be provided with our forces united. Therefore, the Board of the LBO continues to consider that it is an important task of it to unite the most active holders of the awards in the Latvian Brotherhood of Orders to create the support of patriotic powers for successful development of the state and the nation. Also, we would like to facilitate the cooperation between non-governmental organisations with the Parliament and mutual understanding for the creation and strengthening of a democratic and resident-friendly country. To identify all the holders of the orders and decorations and invite them to join and work actively in the Brotherhood to achieve the above mentioned goals. To provide humanitarian assistance to the members of the Brotherhood who are in need for that. To organise cultural and recreational events for the members of the Brotherhood and their family members. To inform the society on our work through the press, mass media, own website, and by issuing periodical printed materials etc. Of course, we need additional funds to carry out the said. At the moment, the LBO does not even employ a clerk; there are no suitable rooms or office equipment. Therefore, it is one of the main tasks of the Board to find funds. That is why the Board calls upon all private persons, business people, banks, Latvian organizations in Latvia and outside it, all who are able and who agree with the tasks of the LBO to help us. We call on you to help the Brotherhood so that it itself could help many others then.